Bas Relief of Maria Hester Monroe. Dimensions: 19.75 inches in height, 15 in width, and 2 inches in depth. 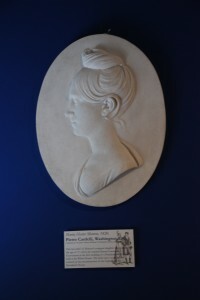 Description: Basso Relievo or bas relief of Maria Hester Monroe. Made in Washington, DC. 3-D Scanning Process: This object was easily scanned with the Kinect scanner, using the Skanect software because it is a small, two-dimensional object.